If you haven't already then it's certainly something to explore or revisit this year if you've previously dipped your toes and haven't found the one. There are so many different flavours and textures of seaweed that there is guaranteed to be one out there that you fall in love with. Quite simply, Seaweed is one of the most nutritious food groups on the planet and very sensible to include in our diet. Traditionally, seaweed has been used to help lower cholesterol, reduce cysts, detoxify heavy metals, reduce water retention & cellulite, reduce inflammation, help with weight loss and balance blood glucose levels. Seaweed helps to cleanse our blood and remove unwanted waste. 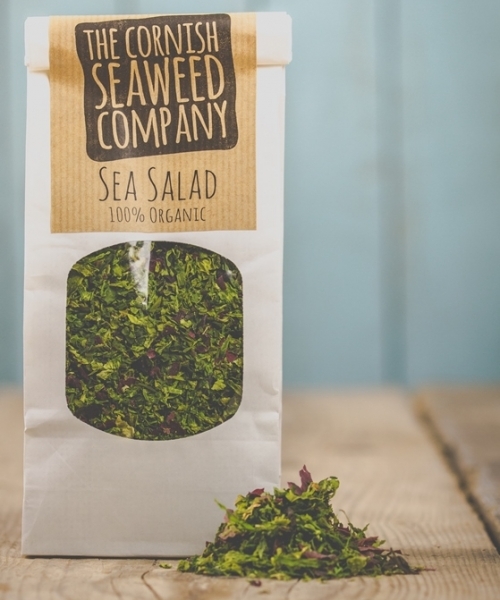 It is also a great source of calcium - there's 10 times more calcium in seaweed than found in milk. On top of all these benefits, it tastes lush! I love good food and I'm a firm believer that as well as being super amazing for our health, food must taste delicious. Where to source it from? It depends where you live! To be honest, it makes sense to find out what seaweed you can find locally and how clean it is. There are some great brands out there, Clearspring have a very good reputation and there are some wonderful companies closer to home (if you are UK based). Algamar is a company based in Spain and even closer to home we have the Cornish Seaweed Company, both provide organic high quality products. Nori is a fantastic alternative to use when making a wrap. Dulse can be eaten out of the packet like crisps or can be rinsed for a few minutes then thrown into a salad. Kelp Noodles are like glass noodles, they don't really taste of much which is perfect if you're not a big seaweed fan! They can be thrown into cooked stir fries or use them to make raw pad thai or noodle dishes.